Ghost Walk Riverside is a community-oriented outdoor festival that feels like a giant block party situated in the middle of the downtown area. The centerpiece of the event is a series of “tours” to prominent buildings, where local high school actors stage mini-plays with creepy stories. Presented in three flavors (G, PG, and PG-13), these are essentially amateur productions, put on for the fun of it – more amusing than thrilling – but the execution is clever enough to be entertaining. Recommended for Halloween fans in Riverside or those visiting other haunts in the area. Tickets: Admission to the block party is free. Separate tickets are sold for each of five "tours." Check out our Ghost Walk Riverside Archive. Haunting since 1992, the Ghost Walk Riverside is a community-oriented event with a block-party atmosphere, located in a downtown area loaded with local eateries. The centerpiece of the event is the “Ghost Walk” – a series of five tours to prominent buildings in the area (morgue, courtroom, etc), where local high school drama students stage mini-plays with ghastly, ghostly, and ghoulish plots. There are multiple tour options: some family-friendly; others creepier (identified as G or PG). Befitting the familial atmosphere, the scares are relatively mild. But watch out: after the plays are over, the ghouls show little interest in letting you walk away; they will pursue you as you head to the next location. The event includes live entertainment, a kids carnival, souvenir stands, food vendors, Tombstone Trolley, and the Dark Dreams Doorway. 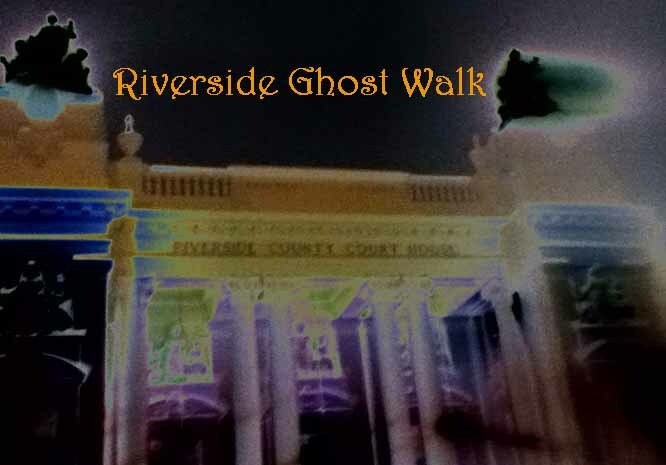 Ghost Walk Riverside takes place in downtown Riverside. Tours depart from the Main Street Pedestrian Mall. Note: This is a rain-or-shine event.